A revolt by fans has forced the board of European champions FC Barcelona to review its $225 million sponsorship deal with Qatar Foundation, the first in the club’s star-studded history. The board is scheduled to discuss the deal on Saturday, which was concluded last December as Qatar won the right to host the 2022 World Cup. As a result of the deal, Barcelona’s willingness to wear the UNICEF logo for free has been relegated to the back of its players’ shirts. Thousands of Barcelona fans revolted against the deal and signed a petition demanding its cancellation. Barcelona coach Pep Guardiola expressed support for the deal on the club’s website. He described Qatar as "the most open Muslim country". Mr. Guardiola, who played for Qatar's Al Ahly from 2003 to 2005 said that “it’s very good that we debate this and also a very good decision of the board’s to let the members decide on it. It’s one of the healthy democratic values we have. I can tell you that I lived for two years in Qatar and my family and I received wonderful treatment." Mr. Guardiola said that "Qatar is on a roll right now, with the World Cup going there, and their bid for the Olympics, and that is the result of an extraordinary effort that the country is making to open itself to the world, whilst maintaining its own traditions." He added that "if the members decide to continue, then we will still have the sponsorship of a foundation which is doing things for research and for culture. If not, then we will move ahead with different resources. Whatever happens, the players will continue to run and fight, which in the end is the most important thing." 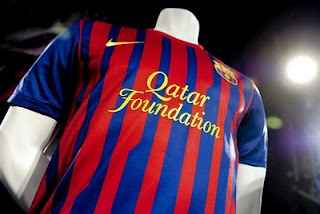 Barcelona's legendary former Dutch coach Johan Cruyff is among the high profile opponents of the Qatar Foundation deal. Mr. Cruijff called the deal "vulgar". The Qatar Foundation, founded in 1995, funds education, scientific research and community development projects primarily in the Middle East. The questioning of the Qatar Foundation deal comes as Barcelona is struggling financially. Barcelona posted a $107 million loss last season and has debts of $596 million.